In fact, today, the snow is annoying me!!! I had great plans today to go out a visit lots & lots of craft & fabric shops..Oh, I never told you did I?? 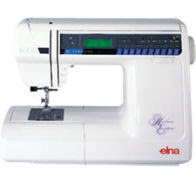 ?..Santa was very kind to me & gave me my sewing machine for Christmas,well, actually he gave me money to go & buy one...& I have! She's lovely! !..I don't actually know how to use her that well just yet, but I'll get there...anyway, I wanted to visit all the fabric shops I could find today & buy some bits & bobs, But NO, I'm snowed in again!!! To make it even worse I'm panicking the snow wont melt by tomorrow..& I have a workshop to teach tomorrow evening!!! We're making some super-cute little 'Thank you' Cards & I'm really looking forward to it, not only because the cards are cute but I haven't seen my group since before Christmas & we've gotta lotta catching up to do!!! I've never cancelled a workshop yet & I really don't want to! - please please melt snow!!! Lovely machine! Why don't you wait and go to Ardingly Quilt show. It's the last weekend in Jan I think.